The mobile web is not just one of the biggest issues facing the web design industry at the moment; it’s also an issue that affects businesses everywhere. It used to be that a business could simply ask a web designer to create them a desktop site and the issue of a company website would be taken care of. Now, with so many different devices available and a huge increase in the number of consumers making use of smartphones to access the internet, it’s important for companies to develop a good mobile strategy. The specific strategy that they choose will naturally depend on what they want out of their mobile web presence – for instance, one company might want to present key information to mobile web users in a simple and straightforward manner, while another might want to make use of their mobile presence to try and tap into the e-retail market, which could make their solution a little more complicated. Whatever a company decides to do with their mobile web presence, there are quite a few strategy options that they could consider in terms of adapting or re-doing their web design for these new mediums. One option, of course, would be to do nothing and simply let mobile web users take their chances with a business’s desktop site on their smartphones. However, for any company serious about developing their mobile presence, this is unlikely to be the best solution, if only because desktop sites tend not to display properly and are tricky to navigate on mobile devices. Another option might be to adapt your current site so that it works better on mobile devices; this is something a web designer skilled in mobile websites should be able to assist with. For instance, it is likely that the navigation of the site would need to be altered to take account of the fact it’s a person’s finger and not a mouse pointer that will be doing the navigating and clicking. 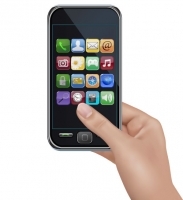 Steps might also need to be taken to ensure the content on the site can be read easily on a range of mobile devices. For many businesses though, this option might not be enough, particularly if your current site is quite complex and so perhaps not that well suited to use on a mobile device. This is one of the reasons many companies are starting to look at getting specifically designed mobile sites that are tailored for their needs and the purpose they are looking to achieve. For example, a site might have a focus on e-retail or it might be a streamlined version of the desktop site, displaying key information that is easy to search and navigate, but that isn’t as extensive or complex as that on the company’s ‘main’ site. Also, as responsive website design becomes more well-known and an increasingly popular option, this is something else that businesses looking to develop a mobile strategy might be interested in. This is where a website is created that will display properly no matter what device is being used, so the same web address and content can be used for the desktop site as for the mobile site and any other versions that there might be. This is a solution that might suit some businesses, so it is definitely worth looking into. However, we also cannot ignore the popularity of apps, particularly for smartphones such as Apple and Android devices. This is a slightly different issue to that of mobile web design, but depending on the business and what it wants to achieve, it could be a useful solution. For example, an e-retail app could be developed as a streamlined, convenient way for users to search for and purchase products without needing to access their mobile web browser. One of the issues with apps is that they tend to need to be developed for each specific device, and they also tend to need a specific purpose to give them a focus and a clear use – they are not just an extension or replication of a website. Overall, a mobile strategy is becoming increasingly important for businesses, and there are plenty of options available for them to choose from if they are looking to take their mobile presence further. As more and more people make use of the mobile web, this is an issue that businesses and web designers alike certainly need to be aware of.